Come and see Sustainability in Action! Our lovely h.Energy posters and leaflets are now available for circulation and display. Please let Averil know if you’d like one to display locally (email: admin@hgnetwork.org). We look forward to catching up with you at these events over the weekend of 13/14th October – in the meantime if you have any queries do contact: events@hgnetwork.org. 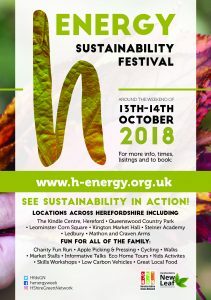 Full event listings and how to book go to: www.h-energy.org.uk. « We had a great HGN Gathering too!